Microgaming once again impresses Canadian players with Secret Romance slot machine, their video slot that features a rewarding love story. Players interested in an easy to play game while having access to impressive bonuses are sure to enjoy the latest release. 3D animated symbols appear on 5 reels, which complete combinations from left to right on 15 paylines. Microgaming is one of the world leading developers, which creates casino based games for both PC and mobile devices. The latest Microgaming game features all the most recognisable aspects of the developer, making it easy to see why multiple awards have been obtained for their creations. The developer has always managed to impress with their latest releases by offering the latest bonuses, rewarding features, and professional gameplay options. Players are able to enjoy the slot with real money or fun play, giving all the opportunity to have a sneak-peak before wagering real funds for the same reward opportunities. Our free play demo game is available right with no registration or download requirements. In regards to bonuses and additional features, Microgaming has included more than just the regular range. In the standard game, players are granted access to wilds, scatters and mystery features, which assists by completing combinations, activates bonuses, and changes into other symbols to provide bigger combinations. A free spin bonus that's activated by at least 3 scatters will include additional advantages by including mystery symbol stacks of up to 20 symbols. These can reveal wilds or any other symbol to increase winnings. All payouts are doubled for these free spins, making it a highly rewarding feature for any wager. Combinations don't follow far behind with their payouts ranging up to 1,200 coins per combinations. Symbols feature each aspect of the romance captured by Microgaming, including rose hearts, gemstone rings, masks, perfect roses, perfume bottles and much more. The mystery symbols are the unique feature in the Secret Romance slot machine , which provides the biggest attraction for players. The regular range of wager values are included with the latest Microgaming release. Since 15 lines are featured, a wager from just $0.15 in required per spin. For those who prefer a higher value, options below the reels are adjustable to reach values in excess of $150.00 per spin, which increases rewards during regular spins and bonus features. Microgaming has always strived to offer fair gaming with high payout rates, which is the exact same for Secret Romance. The Secret Romance free play slot includes rates of over 95%, ensuring players who use mobile, PC, or any other device has the opportunity to trigger the winnings the game was meant to provide. The latest release reminds us all of why Microgaming remains among the top developers. The graphics and animations alone are enough to show off their abilities, but when bonuses and rewards are included, they truly capture the attention of each player and ensure game satisfaction of delivered. Secret Romance slot machine is an ideal slot for romantics, our review brings out those warm fuzzy feelings we have for our romantic partners in life and reminds us of the importance love gives us in life. 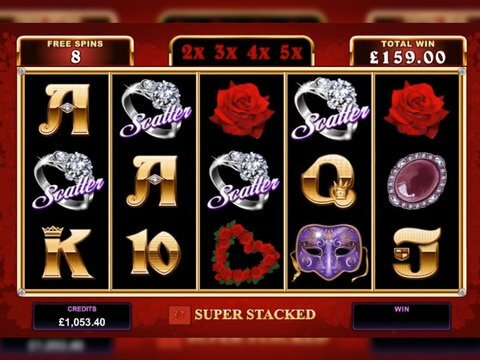 Secret Admirer, is another romance themed Microgaming slot, ideal for Valentines, or anytime the mood strikes, it offers free spins, scatter and a wild symbol, and with a maximum win of 5000 coins, it has more than enough to set the stage for a night of romance. Spin Palace, a top rated Canadian casino is our recommended casino where you can enjoy Secret Romance. With more than 16 years behind their belt, this is one casino that knows the value of providing the best in customer service and proving generous promotions such as its welcome bonus that will see new players enjoying up to $1000 in bonus money on their first three deposits. Joining this will see access to a VIP program, loyalty points, let alone regular monthly promotions. Register today to enjoy all Spin Palace has available.